Kit Colbana is always biting off more than she can chew. She has a knack for finding trouble. This time, though, trouble finds her. Someone from her past drops a case into her lap that she just can’t refuse…literally. People on the Council are dying left and right and she’s been requested to investigate the deaths. The number one suspect? Her lover, Damon. If she doesn’t clear his name, he gets a death sentence. Even if she succeeds? They still might try to execute him. Oh, and she’s not allowed to tell him about the case, either. The stakes are high this time around, higher than they’ve ever been. Kit may be forced to pay the ultimate price to save her lover’s life…a price that could destroy her and everything she loves. 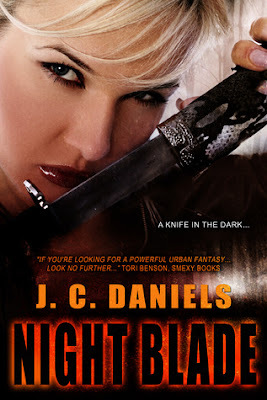 Night Blade picks up Kit's story not long after Blade Song ended, she is bonded to Alpha cat shifter Damon and although their relationship is going well they are keeping their bond a secret so as not to paint a target on Kit's back. Damon is busy cleaning up his new pack and making sure he has everyone's loyalty and they are both getting used to being part of a couple. Kit has strong feelings for Damon but the fact everything is going so well is making her nervous, her past taught her that good things never last and she's waiting for the bomb to drop. Unfortunately she doesn't have to wait long before her ex-boyfriend and member of the Banner police force, Justin, turns up and tells her he is investigating Damon for a spate of murders. If Damon is found guilty and unable to provide proof justifying his actions then he will be executed. Thankfully Justin is giving Kit the chance to investigate but he can't have her tipping off Damon to the fact he is being investigated so he places a magical block on her preventing her from talking to anyone about the case. Damon isn't happy to see Kit working with her ex and he is even more unhappy that she's keeping secrets so how will their relationship survive the case? I really enjoyed the first book in this series so was looking forward to spending more time with Kit and Damon but I have to say J.C. Daniels (alter ego of Shiloh Walker) has really raised the stakes in this instalment. To say I was shocked at the turn of events towards the end of this book is an understatement and I'm still recovering several days after I finished reading. Night Blade is an intense read and one that tore my heart out. I don't want to say too much because I'd hate to spoil it for you so I'm just going to warn you to have tissues on hand for the last third of the story, I'd be very surprised if you didn't need them! I really love Kit's character, she is a fierce fighter and although she isn't as strong as the shifters physically she is skilled with weapons and she isn't afraid to fight for what she wants. She may be scared to admit her feelings for Damon but it is so obvious that she cares for him deeply and she is determined to either prove his innocence or find evidence justifying his actions. There is no way she is going to let Banner bring in an execution squad to go after her man and it doesn't matter what she has to go through to prevent that. You have to admire her for surviving her past and staying strong but she soon finds herself in an even worse situation, one that has every chance of breaking her forever. My heart broke for the things she goes through in this book and I'm dying to get my hands on the next book and see how she recovers from her ordeal. Damon took a little while to grow on me in the first book, the way he treated Kit in the very beginning meant he had a tough battle to win my approval but by the end of Blade Song I had started to fall for him right alongside Kit. I just continued to like him even more throughout this book, he never even wanted to become Alpha of the cats but he had to in order to keep Kit safe and he obviously doesn't regret that decision. He has claimed Kit as his own but is wary of telling people about it because he knows that would gain her new enemies and she has plenty of those already. There was a certain point in the book where I found myself a little frustrated with him for not trusting her but I wasn't particularly surprised by his actions, he wants to know everything about Kit and hates the fact that she's keeping secrets. He has no idea why she can't talk to him and thinks that she is trying to push him away. His actions towards the end more than redeem him for doubting her earlier on though and I really hope that he can find a way to get through to Kit now that she really needs him. This is turning out to be a really fantastic urban fantasy series and it's one I'm really enjoying. I said in my previous review that I thought fans of Ilona Andrews and Patricia Briggs will enjoy the Colbana Files and I stand by that statement even more now I've read the second book. If you're looking for a series that is full of action, heart stopping twists and characters you can believe in then look no further. Broken Blade is at the top of my wish list and I'm not sure how I'm going to survive the wait until 2014 when I can finally read it!